The Thames Library has a 'short story competition' for Heritage Week - inviting stories about early Thames. Subject: Life in Early Thames. Three categories: 8-12yrs, 13-19yrs, and adult. Entry forms available at the Library from 28th January 2014. Entries close 7th March 2014 and winners announced during Festival. Prize in each category: $50.00 book voucher. Why not give it a go and tell a story about your ancestors at the Thames. If we were to go back just 50 plus years...I would write of a time when you actually felt like you lived by the sea, a time when mangroves hadn't taken over the foreshore and the view...now that's what I call Thames! When doing your family or general research on anything related to Thames - you will want to add photographs to bring your stories alive, and allow you and the reader to learn about the Thames of old. The Treasury, Auckland City Libraries, Alexander Turnbull Library, Auckland Museum Library, Matapihi, Digital NZ and Kete Hauraki Coromandel. 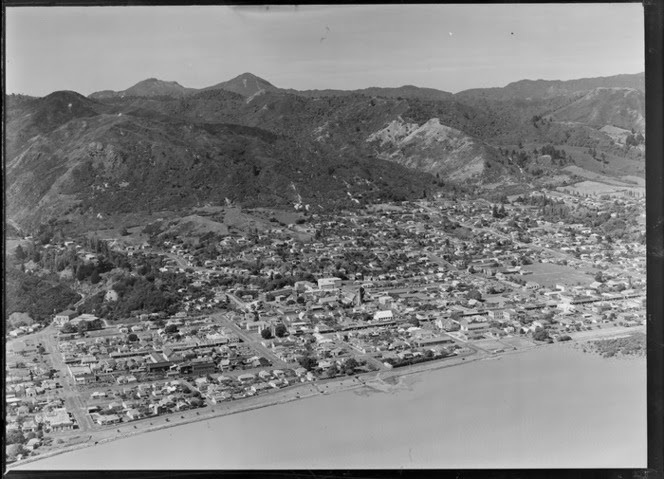 There is a new search engine called the NZ Picture Show - that appears linked to Digital NZ that brings up amazing photo results from a range of sources - and super fast compared to previous options. WHEN THE THAMES VOLUNTEERS VISITED AUCKLAND. Entering THAMES MAYOR, found a treasure of the Mayor presenting medals to the Troopers on Coronation Day in 1902. For background on this event, you can read the preliminary planning that was involved by the Thames Borough and Thames County Councils on 13th May 1902. The paper of the day is full of how the day was to be marked, for instance owners of shops and buildings were planning great displays. The hospital was having Chinese lanterns hanging from the gables, Chas Palmer was planning grand illuminations, Junction Hotel to be covered in flags, and other shops were being repainted. 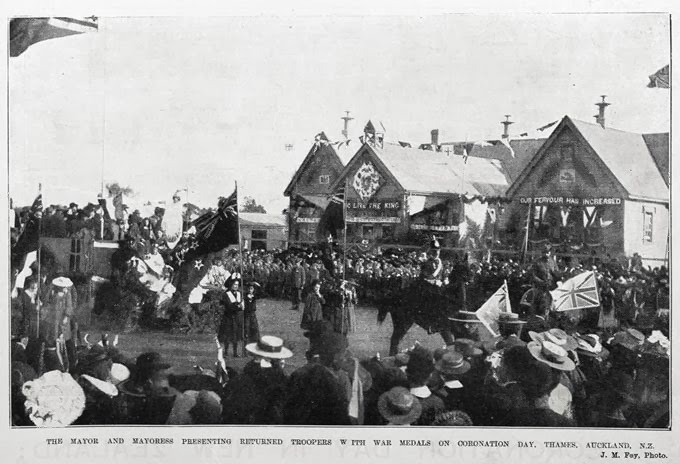 On Saturday 9th August 1902 there was an impressive light display in Thames NZ - and the paper has full details. On 21st August the parade shown in the photo above was held, by all reports a trifle disappointing due to a mix-up that led to a low number of cadets parading. At Thames most of the business places and all the public buildings displayed bunting and in some instances the designs were striking and appropriate. At the local schools yesterday the flag was saluted and the High School Cadets paraded and carried out their part of the programme in a- complete manner. There was to have: been a parade of Territorials and Senior Cadets today at noon, but through various causes the parade was very poorly attended. One officer and two members of the Territorials paraded at the drill hall and a handful of Senior Cadets attended at the Waio-karaka school, a few High School kindly assisting to swell the number. The officer commanding the company and Sergeant Major Tingey were present. Owing to the small attendance the ceremony was curtailed, three cheers being given for the King. His Worship the Mayor (Mr H Lowe) attended and while regretting the small muster, awarded high praise to those lads who had assembled in honor of the Coronation of the King. To encourage the cadet movement and with the object of securing good attendance at parades and encouraging discipline he had decided to donate a prize. Previously I had included a mention of Mr Severn and his amazing astronomical observations based at Grahamstown, New Zealand. In 1874 he was aiming to watch and record the Transit of Venus. Thanks to a tip-off from a fellow Thamesite, I chanced by an article and sketch of Mr Severn. We can but assume its authenticity, but will endeavour to find the article in its full source to seek verification. The factual data written on the page all appears genuine..so for now lets enjoy seeing a sketch of Mr Severn of the Thames Goldfields. Our illustration is taken from a photograph just received from Mr Henry A Severn, of Grahamstown, Thames, New Zealand. This gentleman, formerly in the Sydney Mint, has, like many other observers, been occupied for some time past in making elaborate preparations for observing the transit of Venus on December 9, 1874. Mr Severn's was the chief of the substations under Major Palmer. 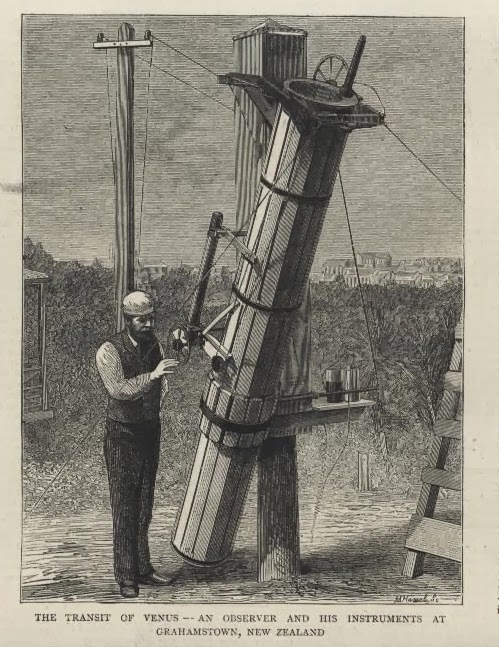 The telegraph wires shown in the picture were conveyed a distance of 300 miles to the substation and telescope - an instrument constructed by Mr Severn himself. The Governor, Sir James Fergusson, very kindly sent Mr Severn a fine chronometer, and he got two others all ticking in electric contact with Major Palmer's clock at Christchurch. Mr Severn's very complete and skilful arrangements were unfortunately defeated by cloudy weather occurring at the time of the transit. Our readers will probably find it easier to sympathise with his disappointment than to realise his feelings on seeing the labour and preparation of years thus rendered useless by circumstances far beyond his own control. Well might he exclaim, "L'homme propose - Dieu dispose." Back to the plea...do you have a relative from Thames who died in World War One? As part of The Treasury's (The Coromandel Heritage Trust) WW100 project a book is being prepared on the men who served from the Thames area. There are still a few names on the memorial that haven't been 100% identified, so please can you take a moment to check the list that Kae has been researching. Is your relatives name is included? Can identify the unknown names: W ALLEY, L AUTRIDGE, F DANN, F DEMPSEY, W GOODWIN, Wm HENDERSON, J MCMILLAN, F STEWART, W TRAINOR. Any relative that has information that could be added to the biography that will appear in the book, please also contact the above address. 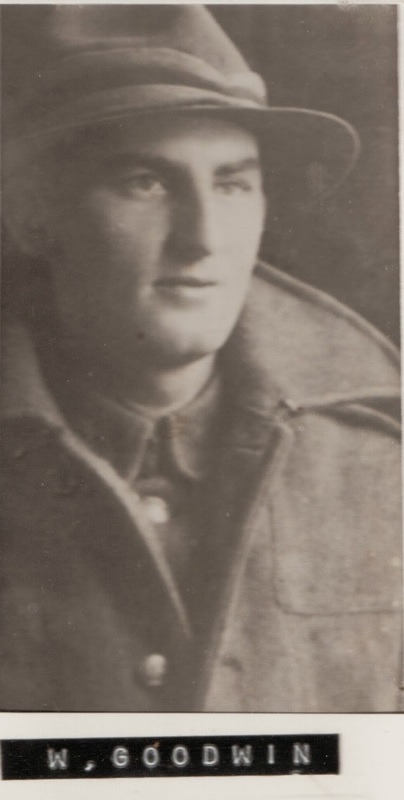 They are always looking for letters, photos, family recollections related to World War One. 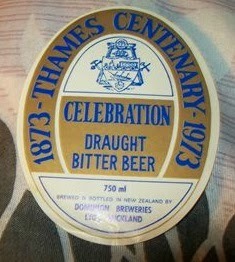 Following on from the previous post on centennial parades and reunions, below are beer bottle labels from two events. First the Thames Centenary 1873 - 1973. 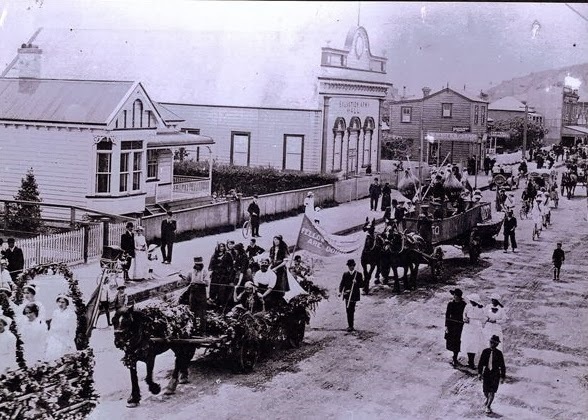 This was to celebrate the founding of the Borough of Thames (the combining of the towns of Grahamstown and Shortland). 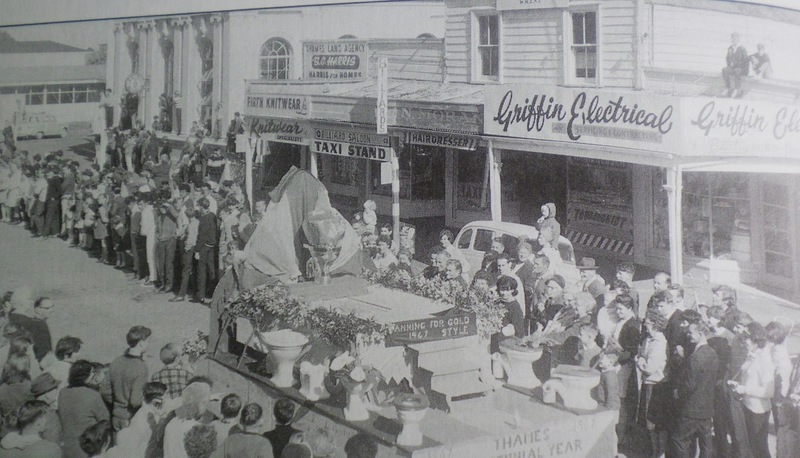 Although the celebrations were just six years after the big 1967 event, the town of 1973 still held major celebration events. How best to remember than in a bottle of beer! A fitting tribute to the town of over 100 hotels. 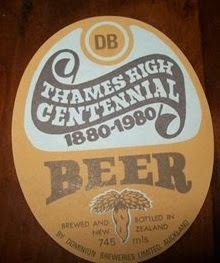 The second label, was on the beer bottles available at the Thames High School centenary of 1980. Once again the celebrations featured a march through the town, as pupils proudly walked in their school decade group. Another year past, won't be long and the 150th celebrations for the town will be here in 2017. Plus take a look at these earlier parades in Pollen Street Thames.